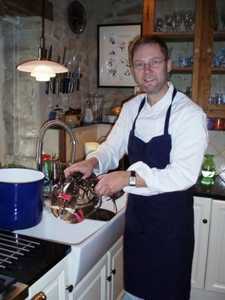 The French Dining School offers five day hands-on cookery courses in the center of the Brittany region of France. 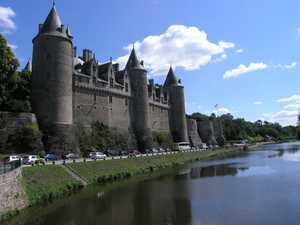 Just three hours from Paris and under one hour from Rennes, Saint Malo, and Dinan, the school is located in the Kerrouet House, a 16th century stone longère. Accommodations for guests are available in adjoining village gîtes. Poul Jensen trained and graduated from one of the best French restaurants in Denmark, Gammel Aalbyho (a member of Relais Gourmand and Tradition et Qualité). He gained invaluable experience at some of the world's most esteemed restaurants, including: Longueville Manor (Jersey Channel Islands), Mietta's Restaurant of Melbourne (Australia) and the world renowned ocean liner, the QE2. In London Poul worked for Noble Rot (Mayfair) and The Walbrook Club (City of London) with Albert Roux. Poul is a member of Eurotoque and Chaine des Rotisseurs, two highly reputed associations for chefs. Classes are held in English and are made up of no more than eight students so that everyone gets fully involved in the cooking and preparation. Adults learn by doing, and the French Dining School allows students of all levels to come together. Under the direction of our Michelin trained chef, class members learn to create gourmet quality cuisine in an informal relaxed learning environment. The emphasis is on French and modern European cuisine, but Scandinavian and international menus are also included. 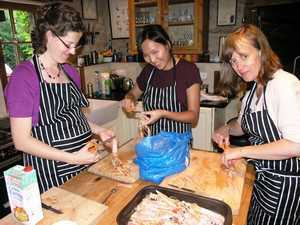 The five day cooking course commences on Monday at ten in the morning with a general introduction to the week's cooking. Basic kitchen skills are introduced, including safety, menu preparation, stock making, handling of kitchen knives, use of equipment, etc. The day's menu is discussed before starting preparation and actual cooking. Two meals are prepared each day with students enjoying lunch around one o'clock and dinner around seven thirty. There is a break after lunch and lasting until five. Students can relax in the garden, go for a swim, or explore the beautiful medieval towns and villages nearby. Dinner normally finishes at ten at night. A student graduation ceremony follows dinner on Friday. Over the course of one week students will be directly involved in the planning, production and presentation of over 35 individual dishes . Every dish adheres to a fine dining and gourmet standard. Students are encouraged to get fully involved so that they gain the knowledge, skills and confidence to reproduce the dishes again when they return home. The menus are carefully selected to ensure as wide a culinary experience as possible. Lunch and dinner each day at the school is inclusive of wines, champagnes and all drinks. A full unique program of recipes, menus, culinary notes, wines, etc. is made available to each student. Students visit one of the famous food markets in Rennes, Dinan or Lamballe, followed by a traditional lunch in a Breton restaurant. There are, depending on the season, visits to specialist farms including a snail farm, a goat cheese farm, and a cider producer. In the autumn, there is mushroom collection in the forests. The cooking courses run from March through October each year. More information is available on the French Dining School Website.